Looking for a refreshing non-vampire or zombies Jane Austen-inspired novel for this summer? 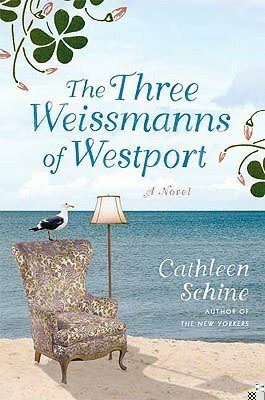 The Three Weissmanns of Westport by Cathleen Schine should be the perfect warm weather read– whether at the beach or sipping iced coffee in air-conditioning. At nearly every turn you’ll recognize Schine’s modern take on Sense and Sensibility—from the patient semi-retired lawyer Roberts to the young actor Kit who takes up with older woman Miranda Weissmann. When Betty Weissmann’s husband of 50 years decides to divorce her, he boots her out of their swanky Upper West Side abode at the request of the younger woman in his life. Betty retreats to a cousin’s cottage on the Gold Coast of Connecticut, specifically in Westport. Her two daughters, bold literary agent Miranda [Though she was acknowledged even by herself to be extraordinarily self-absorbed, no one ever accused Miranda Weissmann of being selfish.] and librarian Annie decide to lease out their Manhattan apartments to join her. And though there aren’t many details about Westport and I moved away at age eight when my parents divorced, I remember Compo beach quite well and it figures dominantly in the book. The Three Weissmanns of Westport proves to be a clever diversion. This entry was posted on June 16, 2010, 22:03 and is filed under Books. You can follow any responses to this entry through RSS 2.0. Both comments and pings are currently closed.